Charlie Daniels has just released his fifth book, “Let’s Make the Day Count: The Everyday Wisdom of Charlie Daniels,” and he will be in Durango this weekend to sign copies and greet fans. “Let’s Make the Day Count” is a book broken into short chapters, or vignettes, that give little life lessons and insight into the Country Music Hall of Famer’s own life experiences. Daniels said these hundred entries are in what his publisher calls a gift book, which was different than anything he had written before. The book is broken into 100 different subjects, such as “Patience and People,” “Standing Your Ground” and “A Mile in My Shoes.” There’s also one called “Close Call in the Rockies,” which deals with Daniels’ medical scare in 2010 while snowmobiling in the area. He writes that the left side of his body started to become numb, and he feared he was having a stroke. He was brought to Mercy Regional Medical Center, where it was determined he was indeed having a stroke brought on by a blood clot in the right side of his brain. Fortunately, he writes, he was quickly administered a shot that dissolved the clot, preventing the stroke from causing major permanent damage. He was airlifted to Swedish Medical Center Denver and was released in a couple of days. While he’s fine now, “I learned a lot about blood pressure during that time. There is a doctor in Vail who’s done quite a bit of research on how altitude affects blood pressure, and there is a definite correlation there. He said the lesson he took away from the incident was that life is going to happen. Another chapter, “Work and Leisure,” tackles the challenge of balancing work with relaxation, and the need to recharge. For Daniels, who still plays more than a hundred shows a year, that means taking a couple of months off and traveling to the Durango area with his family. They stay in a house they built here a little more than 20 years ago. So, how does Daniels recharge? Daniels said that at 82, he is slowing down a little, but there’s always something to keep him busy. 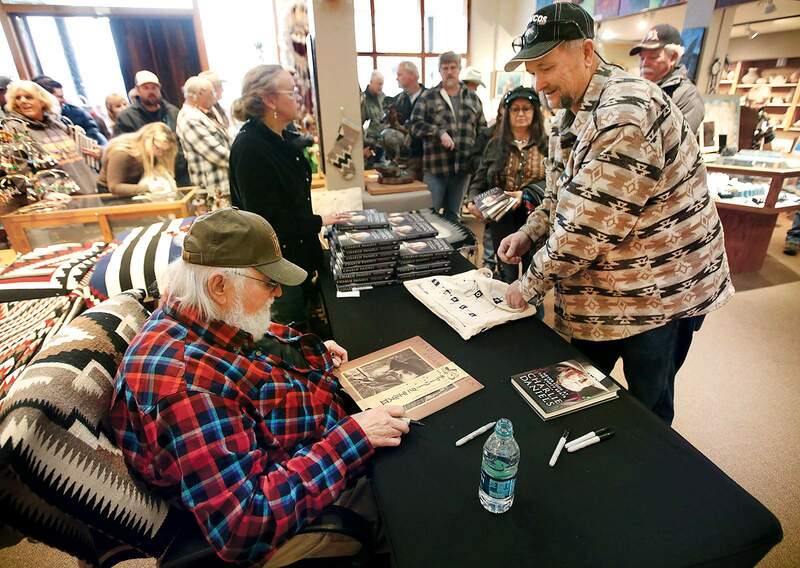 What: Charlie Daniels book and CD signing. When: 2 to 3 p.m. Saturday. Where: Toh-Atin Gallery, 145 W. Ninth St.